Free Shipping on $50+ order plus Free Returns. Restrictions apply. Offer valid in store and online at Athleta through 9/14/15 in the US and Puerto Rico. Click here for complete details. 20% off Full-Priced Sweaters and Outerwear. Athletic women can have a hard time finding the right swimwear, running clothes, and yoga apparel. Luckily, Athleta carries a large selection of athletic apparel designed by and for women. Attach some Athleta coupons and you’ll hit a home run with the price. At any stage of your workout, you want to feel supported so you can reach your next goal. When you shop at Athleta, it's no sweat to find all of your quality workout essentials in one place, at great prices. If you're still learning the ropes about how to use an Athleta promo guide, follow these simple steps and start gearing up. 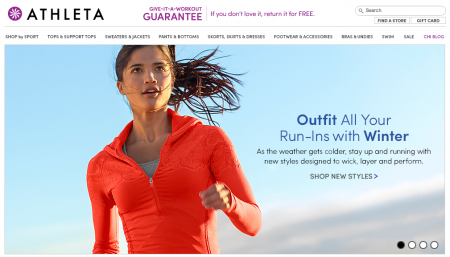 Take a look at the Athleta coupons featured on CouponPal and pick the one that suits you best. Click "get deal" for the promotion. Some promos will require a code, in which case a separate window will open. At this point, be sure to copy and save the code to apply during checkout. 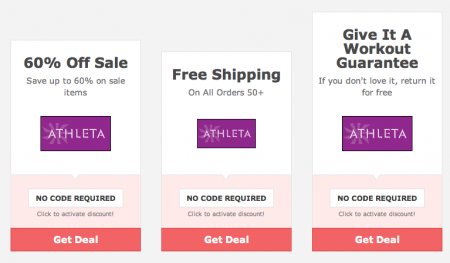 If a promotion does not require a code, you will be redirected to the Athleta site and the promotion will be applied automatically. Find shirts, pants, shorts, dresses, swim wear, accessories, and more. You can also choose to "shop by sport" to find exactly what you need for your specific workout. After you've found an item you like, click "quick view" to see pictures, sizing, colors, and pricing. If you have any questions about sizing, every item has a "size and fit guide" to give you the most support. Select your size and click "add to cart." At this point, you can checkout or continue shopping. Once you're done browsing, click "checkout" in the upper, righthand corner. Review your items and choose which shipping method you'd like to use before proceeding with checkout. Fill out your shipping and billing information after you click "checkout." During the "payments and promotions" stage of checkout, you can apply a promotion code to apply toward your purchase if you have one saved. When are finished filling out your information, click "continue" for a final review of your purchase. 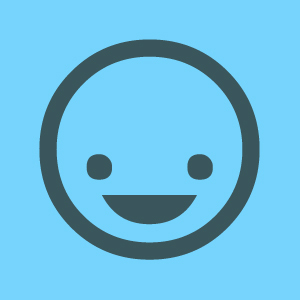 Once you're happy, click "place order." Finding the right exercise gear to get back into shape can make the going tough. Get motivated and discover your fitness needs haven when you shop at Athleta. Whether you're looking for tops for winter runs, pants for hot yoga, or need fitness and health tips, Athleta is just what the doctor ordered. When you use an Athleta promo code, the savings will surely get you back on your feet. Are you looking for ways to make now the prime of your life and health? Athleta can help! Equip your look from head to toe, for any season and any activity. You can shop by sport or search items like pants, sweaters, footwear, and more. If you're getting back into the swing of things or are as fit as a fiddle, check out the Chi blog for tips on staying in the best of health. In addition to providing all the quality essentials for a healthier you, Athleta strives to motivare women to get in the pink and become the best versions of themselves through inspirational stories, advice, and tutorials. Originally founded in 1998, Athleta was acquired by Gap Inc. in 2008. Athleta's gear is designed for any and every active woman. No matter the sport, Athleta strives to provide quality gear to get you feeling on top of the world. All Athleta products have to clear quite a few hurdles before being approved across the board, so you'll know your gear will have the endurance you need. Whatever your sport or fitness fancy, Athleta is committed to making you the picture of health. Whether you're hitting the road, balancing on the mat, or climbing toward your goals, Athleta will be there to provide quality, supportive gear. Take a look at our Athleta promo codes and save while you take a turn for the better. Are you tired of being on the mend and ready to get back into shape? When you shop at Åthleta you can find all of your fitness gear necessities, exclusive tutorials, and unique tips to get you in the best of health. If you have any questions while you shop, check out these commonly asked questions for the gameplay. 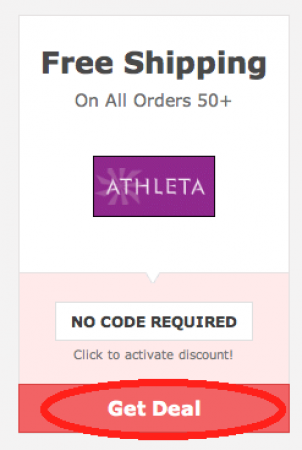 Why isn't my Athleta promo code working? Although a rarity, promo codes occasionally do not work because there are specific restrictions or the code has expired. We are constantly working on finding new great deals for you, so be sure to check for any limitations before making a purchase. How do I contact Athleta customer service? Athleta wants to make your shopping experience as smooth as possible so you can get back on your feet and feel on top of the world. You can write a letter to Athleta at 5900 North Meadows Drive, Grove City, OH 43123. For a more rapid response, call toll-free at 877-328-4538. From the home page of the Athleta site, scroll down to the bottom of the page and click "customer service ." From there, you can find answers to many of your shopping questions. Also, on the right-hand side of the page the contact information is listed and there is a link to an email forum as well. If your purchase isn't the right fit or simply doesn't suit you, Athleta will gladly exchange or refund your items. 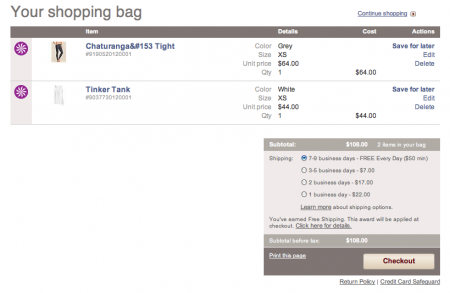 Athleta even includes a prepaid shipping label so your return is completely free! Simply return your items within 30 days of purchase. For more details on the Athleta return policy, go to the customer service page and then click on "return policies " under free returns & exchanges. What if I don't know my size? If you are unsure about your size, Athleta has a number of sizing charts for different items. From the home page, scroll to the bottom and find "size charts & fit guides." Of course, if you have any questions along the way, do not hesitate to contact customer service for additional help. For all orders over $50, standard shipping is free. Items mailed with free shipping generally arrive within 7-9 business days. You can also choose different shipping options with additional costs. Click on "shipping and delivery" for more information.